Joining the Tonkatsu bandwagon in Manila is Kimukatsu (キムカツ). The most famous pork cutlet restaurant in Japan with multiple locations in Tokyo, Osaka, Yokohama, Sendai, Korea, Hawaii and California, U.S.A, is now in the Philippines! Since it is my first time to eat at Kimukatsu, I asked for assistance from one of the owners. He is very helpful in describing the menu and the types of katsu (short for katsuretsu, meaning cutlet) that they offer. All of them are very friendly so don't hesitate to ask for assistance if you're not familiar with the condiments and dishes that they offer. Ebi Mayo or prawn mayonnaise (Php210.00 + 10% service charge) is a fantastic appetizer. Kimukatsu's version is very delicious. Their shrimp dish consists of 8 pcs. shrimp, peeled and deveined . Kimukatsu has one of the few shrimp dishes that I like. The shrimp is soft and tasty. It is not really healthy so people with high blood pressure must eat in moderation. I love the restaurant's unique bamboo rice container. Its rice is special, not your normal cheap everyday rice. The rice is freshly cooked. It comes unlimited when you order the set meal. The white miso soup is creamier and sweeter, which is just right for my palette. I don't like the red miso because of its spicier kick. Some of our companions prefer the red one though, so it all depends on your taste buds. Both has generous servings of sea kelp and diced soft tofu. Unlimited sliced fresh cabbage. For me, its the finest cabbage salad ever. Best with Kimukatsu goma (sesame) dressing and the kimukatsu salad dressing (shoyu paste soy-vinegar). A tonkatsu (pork cutlet) meal will never be complete without the traditional sesame seeds grinding ritual to go with their sauce. Kimukatsu's black sesame seeds are imported from Japan that's why they are limited to only one serving per person. Black sesame seeds, especially after being toasted, are fragrant and nutty and wholly addictive. Kurogoma or Black Sesame Seeds are also used to promote healthy bowels and in Chinese medicine, they are used to promote healthy kidneys and liver. They also contain phytosterol which apparently helps to reduce cholesterol. Ponzu sauce (the mild) is in the white sauce pot. I decided to experiment by mixing both sauces to my tonkatsu. The first sauce on the right is the preferred sauce of Filipino customers because it is sweeter, while the one in the middle is vinegar with grounded black sesame. Some people prefer a few dash of the pink Himalayan salt at the right corner. Kimukatsu's tonkatsu is very unique! I was so amazed looking at those paper thin pork cutlets. Unlike the classic tonkatsu (breaded pork cutlet) that are cut into to one thick piece, Kimukatsu's pork loin is thinly sliced. 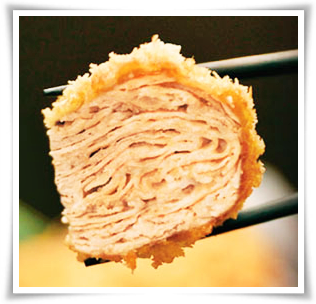 Twenty five (25) layers of paper thin meaty goodness are painstakingly crafted, stacked and rolled to made one regular size tonkatsu. So yummy and flavorful! In Japan, according to my friend, this type of multi-layered tonkatsu is called a "mille-feuille katsu." Sounds French to me than Japanese. He he he. Kimukatsu's tonkatsu is not oily unlike other tonkatsu. It is very crispy on the outside and tender juicy in the inside. We are very lucky here in the Philippines because Kimukatsu's tonkatsu costs an arm and leg in Japan while it only costs Php380 per order here in the Philippines, with unlimited Japanese rice, freshly sliced cabbage, complimentary appetizers of Tsukemono (pickled vegetables), mayonnaise, sauce and even unlimited hot tea. I can say that this is a perfect deal. You could even order by the set if you have a companion with you. A family of seven or eight could order the 7 flavors for only Php2,400 Vat inclusive just add 10% service charge though. Light and fluffy, yet extremely juicy and flavorful, it is the softest tonkatsu you'll sink your teeth in. Kimukatsu's version is divine! I have a penchant for sweets. I love Kimukatsu's black sesame pudding. It is the best among all the desserts that I had tried in Kimukatsu Php110 plus 10% service charge. Japanese Panna Cotta Php110. Served cold. This creamy goodness is the Japanese version of Panna Cotta ( which by the way literally means cooked cream in Italian ) It is a rich-tasting, absolutely divine dessert. This luscious soft Japanese panna cotta is a perfect accompaniment to your Tonkatsu meal at Kimukatsu. Macha Parfait Two scoops of green tea ice cream with one tablespoon red bean paste, 2 pcs. of mochi. Green tea has a very refreshing green grass aroma. It helps cut the smell of fish and grease in our dinner. The green tea used in Green Tea Ice Cream is called Matcha in Japanese. Matcha is in powdered form, and so it has a much more concentrated flavor than green tea leaves. It is forbidden to be mixed with green tea made with regular tea bag. Matcha is also a drink that is used in the tea ceremony in Japan, but you don’t drink it as much as brewed green tea. Black sesame ice cream or kurogoma aisukurimu. Kurogoma is believed to have health benefits that is why this ice cream became very popular in Japan for a while. It is said to be loaded with minerals such as magnesium, phosphorus,copper, iron and calcium. This is the first time I've ever tried an ice cream with Black sesame flavor. My initial impression is that it was strange because of the texture of the partially ground sesame seeds, but I loved the taste. It has a sweet, roasted and earthy flavor to it. It was unlike anything that I’ve ever tasted before. I just hope they could reduce the amount of sugar though. The service is good. The staff is friendly and accommodating. I just don't like it though when they shouted "Irasshaimase" in chorus at the top of their voices on my ear when I passed by. They actually remind me of Cyma's enthusiastic chorus of "Opa." Lol. With their delicious dishes, Kimukatsu gets my highest recommendation. I couldn't wait to go back.